How exciting to be expecting a healthy baby boy at my five month ultrasound! After slipping and falling on ice, another ultrasound was performed at 38 weeks and revealed just the opposite. 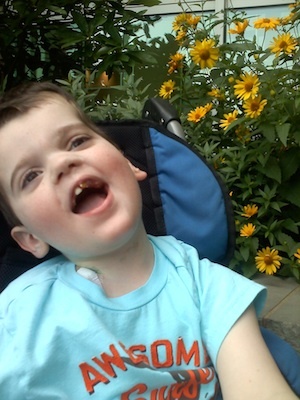 A cleft lip, heart problems, and enlarged ventricles in his brain. I was seen by a perinatologoist immediately and it was confirmed that Cohen had a genetic disorder, though his diagnosis wouldn’t be known until after he was delivered and tests could be done. At 40 weeks Cohen was born via emergency C-section with NO cleft lip! Cohen was in the NICU after delivery for observation where he had several tests done. After seeing Cohen a couple things stood out: his left foot would shake, and he had a small bump on the bottom of his left foot. Doctors didn’t think anything of the bump and said his foot twitching was related to enlarged ventricles in his brain. But was it? 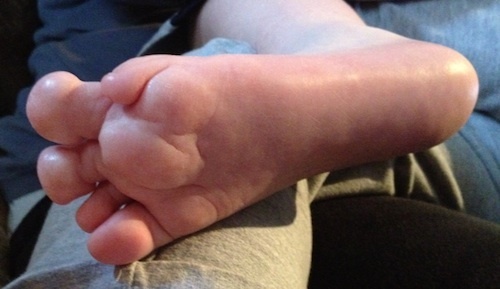 While seeing all of Cohen’s specialists, I would always ask, “what is this bump on his foot?” As the bump on Cohen’s foot continued to grow and get bigger, his toes also got bigger. Cohen not only had a “bump” on his left foot, he had bone overgrowth called fibrous dysplasia on the left side of his skull, and lipomas (fatty tissue) on his left side of his stomach. Last but not least, Cohen had a large growth on his left tonsil making the ENT doctor think he could have lymphoma. After having his tonsils and adenoids removed the biopsy came back negative. Thankfully it was only a benign tissue overgrowth. After running every genetic test possible, everything still came back normal. Finally, the third genetic doctor we saw said he could have Proteus syndrome, an overgrowth syndrome of different body parts, but there was no way to test for it. It was a long shot, but the geneticist could send his case to the National Institutes of Health (NIH) in Bethesda, Maryland to be reviewed. Fortunately, Cohen was accepted into the NIH program. We were ecstatic to finally be close to a diagnosis, but that answer came with a lot of fear and more questions. After a five-hour drive from Pennsylvania to Maryland in December 2011, our journey for answers had just began. Day 1 consisted of family history, his physical and lots of paperwork. Day 2 consisted of bloodwork that was a nightmare since Cohen doesn’t give blood easily. Next, was the ophthalmology consultation where we learned that Cohen’s right eye was affected and the tissue of his eye was also growing. Finally we met with the genetic counselor at the end of the day. On day 3, Cohen met with physical therapy and occupational therapy to see what his abilities were, and what we can do at home to improve. After this consultation, Cohen had an ultrasound on his stomach and testicles. We learned that Cohen’s left kidney was slightly larger than his right. It is very common in Proteus for organs to be asymmetrical. They look at the testicles in boys because it is also common for them to be asymmetrical. They are keeping an eye on this every 6-12 months or as needed if problems occur. Next up we saw ENT to check the bone growth on his left side of his head. He has a very narrow ear canal. This will eventually lead to the bone closing his ear canal and impacting the wax and fluid, causing infection and hearing loss, and someday requiring surgery. On day 4, we reported to the inpatient unit at the NIH where GI and neurology came to us. This was nice since the day before we ran around like maniacs! Dermatology also came to us and they checked Cohen over from head to toe. He had a skin biopsy that later confirmed the presence of the AKT1 gene. We also met with the genetics team during the dermatology consult. After the dermatology consult I finally had a chance to chat with the geneticist, a wonderful and kind man, who was the first to answer all of my questions, from the first days of Cohen’s life to present. After an extensive workup, lots of paperwork, lots of questions, and lots of photos, the week FINALLY came to an end. Proteus syndrome is a rare overgrowth condition. The overgrowth in Proteus syndrome can cause differences in the appearance and growth rate of various body parts. This overgrowth is also typically asymmetric, that is, it does not affect corresponding body parts similarly. The word “Proteus” comes from the name of the ancient Greek God of change. People with Proteus syndrome have an altered AKT1 gene in some of their cells. This altered gene makes an abnormal protein….This means that the AKT1 gene has a “spelling error” that causes an abnormally active protein to be made in the body. This active protein is thought to increase rates of cell growth and may prevent cells from dying off when they naturally would. Researchers think that this helps to explain why patients with Proteus syndrome experience overgrowth and are at an increased risk to develop tumors. Proteus syndrome mostly affects the bones and skin, leading to orthopedic and skin problems. Some people with Proteus also have lung problems and are at high risk for blood clots. Cohen has also been diagnosed over the past four years with cortical dysplasia, where the neurons in the brain failed to migrate in the proper formation during development, which has caused him to have severe seizures requiring a VNS (vagal nerve stimulator). He also has gastroparesis (delayed gastric emptying), pseudo obstruction (impairment in the ability of the intestines to push food through), visual blindness, cerebral palsy, and is nonverbal. He has a port for IV fluids, and a VP shunt for hydrocephalus. His additional symptoms are thought to be related to a placental blood clot that occurred due to his Proteus syndrome. There are only 200-250 cases of Proteus syndrome. Joseph Carey Merrick, known as the “elephant man,” was also known to have Proteus syndrome. Every person with Proteus syndrome is different and no two people will have the same medical concerns. Currently, researchers are working to develop a medication that targets the protein made by the AKT1 gene. It is what it is, Proteus or not. Cohen is who he is and we love him no matter what. We have learned a different way of life, but a new perspective on life. We have a new understanding of patience, strength, hope, love, and most of all a new sense of faith in GOD. I couldn’t imagine our lives and our family any other way. We truly are blessed and are thankful for all the things Proteus has taught us. Below are two links I have listed for more information on Proteus and one on CLOVES Syndrome, another rare overgrowth syndrome. For information about the NIH program and doctors who are working on Proteus syndrome, please contact the Proteus Syndrome Foundation. Jessica Pearce is a wife and stay at home mom to Cohen and his little brother. Cohen and his brother have an amazing daddy who provides for them, loves them, holds them, plays with them and who is teaching them great things! Jessica has always wanted to be a nurse. She has a degree as a medical assistant, and had started classes for RN school when she got pregnant with Cohen. After Cohen was born, she went back to school for LPN. Unfortunately she was unable to finish due to Cohen’s medical needs, but hopes to someday go back. Everything happens for a reason, and for now she’s Cohen’s own personal nurse! Can’t get any better then that!